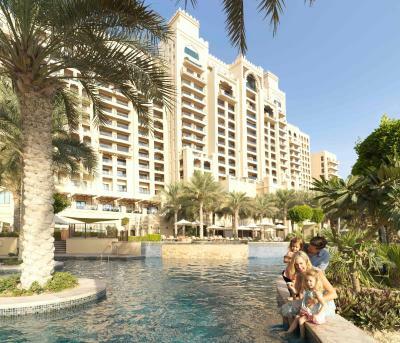 Lock in a great price for Fairmont The Palm – rated 8.6 by recent guests! I would like to thank Mr. Andri Grozovski , the Resort assistant Manager, for his attitude and support to insure that this stay is a pleasant and to be remembered! The water sports activities were very good. The food was excellent. Amazing staff who remembered our names and always made us feel welcome. The private Fairmont Gold floor and lounge was fantastic. The room and ocean view were incredible. The staff engagement with our young son made the experience special. Got upgraded into a corner suite which made the stay even better. 2nd time in the hotel and definitely coming back. The best Christmas decor😊Thr restaurants in the property are really good,must try the Indian restaurant. Fairmont The Palm This rating is a reflection of how the property compares to the industry standard when it comes to price, facilities and services available. It's based on a self-evaluation by the property. Use this rating to help choose your stay! One of our top picks in Dubai.Located on the beach in The Palm Jumeirah, Fairmont The Palm offers luxurious accommodations with spectacular views. It features a free private beach area, 4 outdoor swimming pools and a bar. Dubai Marina is 5 mi away. 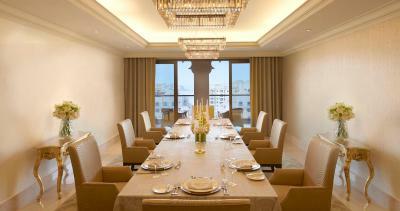 All accommodations at Fairmont The Palm features a contemporary décor and calm colors. 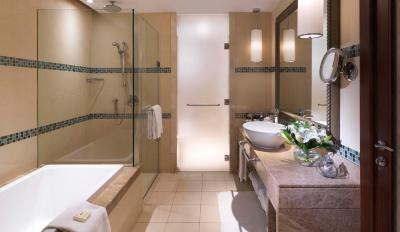 Each room comes with a private balcony, a flat-screen TV and an private bathroom. The suites include a living room. Enjoy authentic Brazilian cuisine at Frevo Restaurant. The Flow Kitchen features culinary classics from around the world. Ba offers Asian Cuisine while Little Miss India serves the best Indian cuisine. You can unwind and relax at The Cigar Room and the Mashrabiya Lounge. The hotel provides a 24-hour front desk and free valet parking. 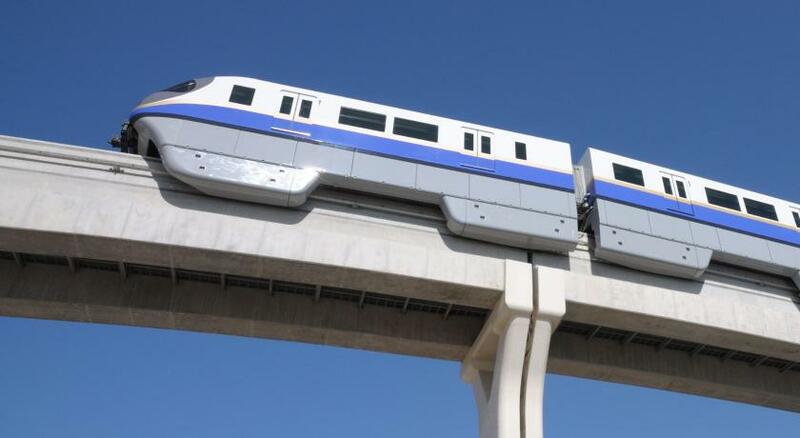 A free shuttle service to Mall of the Emirates is available. Dubai Mall is 30 minutes by car, and Emirates Golf Club is a 10-minute drive. Dubai International Airport is 22 mi away. 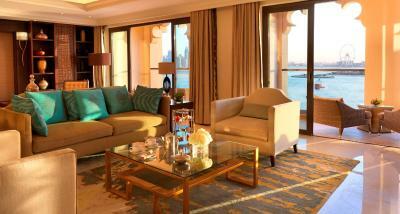 When would you like to stay at Fairmont The Palm? 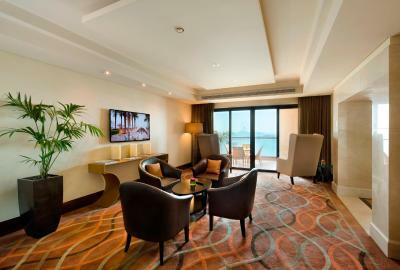 Featuring a balcony with a partial sea view, this air-conditioned room features a contemporary décor. It includes a flat-screen TV, a minibar and an electric teakettle. Free toiletries are available in the marble bathroom. Featuring a contemporary décor, this air-conditioned room includes a balcony overlooking the pool, the sea or the Dubai Marina skyline. It includes a flat-screen TV, a minibar and an electric teakettle. Free toiletries are available in the bathroom. 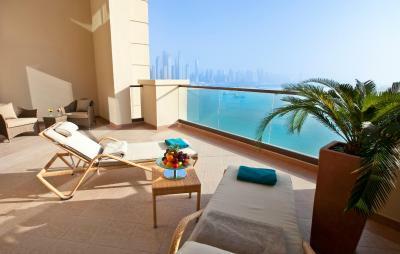 Offering a balcony with a Palm Residence view, this air-conditioned room features a contemporary décor. It includes a flat-screen TV, a mini-bar and an electric kettle. Free toiletries are fitted in the bathroom. The room provides access to the Fairmont Gold lounge located in the 9th floor which features spectacular sweeping views of the Arabian Gulf and Dubai Marina skyline. An ambiance of luxurious exclusivity is experienced by a dedicated butler service enhanced by a wealth of exceptional in-room amenities. Featuring a contemporary décor, this room includes a spacious balcony with a Palm Residence view, a luxurious 5-piece marble bathroom with a separate rain shower, and a 40" High Definition LED. 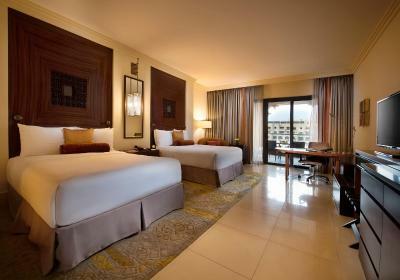 Featuring contemporary décor, this room includes a spacious balcony with a Palm Residence view, a luxurious 5-piece marble bathroom with a separate rain shower and a 40-inch High Definition LED TV. 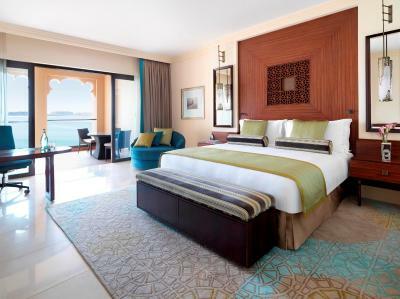 Featuring a balcony with a partial sea view, this air-conditioned room features contemporary décor. It includes a flat-screen TV, a minibar and an electric teakettle. Free toiletries are available in the marble bathroom. This twin room has a balcony, bathrobe and mini-bar. 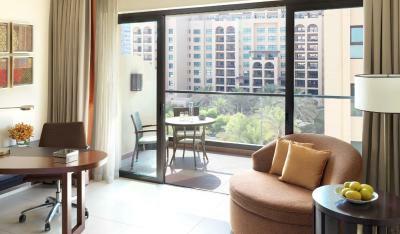 Featuring a balcony with a Palm Residence view, this air-conditioned room has contemporary décor. It includes a flat-screen TV, a mini-bar and an electric teakettle. Free toiletries are available in the bathroom. The room provides access to the Fairmont Gold lounge located in the 9th floor which features spectacular sweeping views of the Arabian Gulf and Dubai Marina skyline. An ambiance of luxurious exclusivity is experienced by a dedicated butler service enhanced by a wealth of exceptional in-room amenities. 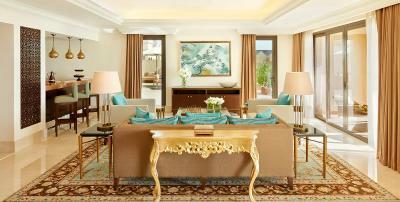 The Corner Suite features a spacious living room area with plush sofas and a dining table. 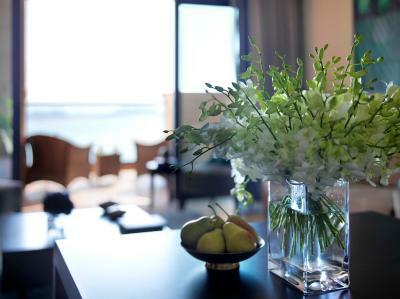 With a fresh and vibrant color palate, the suite also has panoramic terrace views of the Gulf, Dubai Marina skyline, and the surrounding residence gardens. Additional amenities include in-room business facilities with a media panel connectivity kit and an en-suite marble bathroom. Featuring views of the Gulf and Dubai Marina skyline, this air-conditioned suite has a separate living room and a dining area. It also includes a butler's pantry with a number of kitchenette amenities, including a refrigerator and a microwave. 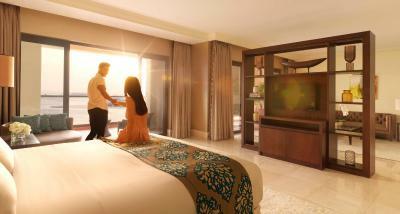 Moreover, guests can expand the space by connecting with an adjoining Deluxe Room. Featuring a contemporary decor, this room offers a spacious balcony with views of the pool and Dubai Marina Skyline, luxurious five-piece marble bathroom with a separate rain shower, and a work desk. It features a 40” LED television, and high-speed Internet access. Interconnecting rooms available upon request. The room provides access to the Fairmont Gold lounge located in the 9th floor which features spectacular sweeping views of the Arabian Gulf and Dubai Marina skyline. An ambiance of luxurious exclusivity is experienced by a dedicated butler service enhanced by a wealth of exceptional in-room amenities. Featuring a luxurious décor, this modern, air-conditioned apartment has 2 double beds and a private balcony overlooking the Golden Mile and the iconic seven star Burj Al Arab. The living room includes sleek furniture with a flat-screen TV, a dining room and a full kitchen. A dedicated laundry room and spacious built-in closet space are also featured. The two bedroom apartment features spacious bedroom and living spaces, with panoramic views of the Gulf and the dotted marina skyline as far as the eye can see. A purpose built and seamless bright white kitchen with stylish fixtures and designer appliances is complemented by full dining and entertainment setups. The laundry room provides every day functionality while floor to ceiling windows running the length of the apartment allow for spacious natural light. This apartment has a full media panel connectivity kit, three high definition LED TVs and high-speed Internet access. The two bedroom apartment features spacious bedroom and living spaces with panoramic views of the Arabian Gulf and the dotted marina skyline as far as the eye can see. A purpose built and seamless bright white kitchen with stylish fittings and designer appliances is complemented by full dining and entertainment set ups. The laundry room provides every day functionality while floor to ceiling windows running the length of the suite allows for ample natural light. This apartments benefits from a full media panel connectivity kit, three high definition LED televisions and high-speed Internet access. Some rooms offer a balcony subject to availability. Modern décor suffused with Arabic design elements, the Presidential Suite is the largest in the guest room portfolio, providing a spacious and spacious living area and outdoor terrace, as well as a dining room that seats up to 10 guests, connected to a private butler’s pantry, perfect for entertaining. 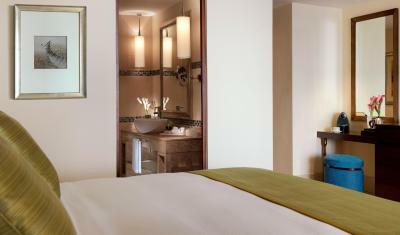 The luxuriously-furnished bedroom is connected to a private bathroom, equipped with a jetted bathtub and rainforest shower. Guests can enjoy spectacular 180 degree views of the Dubai Marina skyline and Palm Island, and have access to a full range of Fairmont Gold services and amenities, including on-call butler service. This luxuriously-furnished apartment feature a spacious bedroom, two smart bathrooms, and a dedicated living space with a large balcony overlooking the Dubai Marina skyline and the Gulf. Guests will also enjoy a custom-built kitchen with full set up, seamless cabinetry and stylish appliances. A home office area and a dining table for six allow for both work and entertaining, panoramic windows, a Bose home entertainment system and two flat screen high definition LED TVs, with the 52 inch screen as the largest of the two, rounds out this lifestyle experience. This family room features a balcony, bathrobe and tile/marble floor. Fairmont The Palm, named after Dubai's iconic Palm Jumeirah, is located on the world’s largest man-made island shaped in the form of a palm tree. 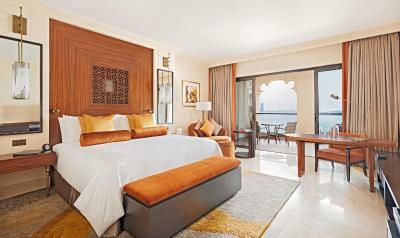 This beachfront Dubai hotel showcases unrivalled views of the Arabian Sea. 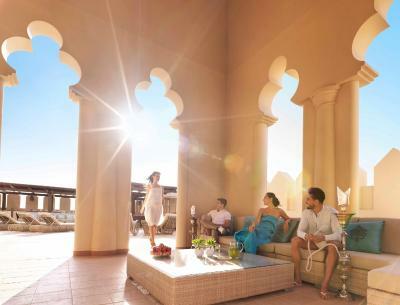 House Rules Fairmont The Palm takes special requests – add in the next step! 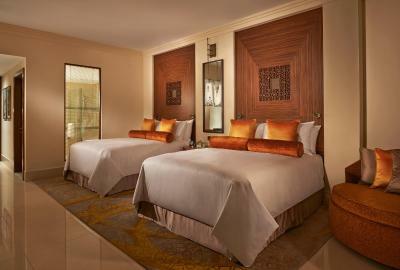 Any additional older children or adults are charged AED 314 per night for extra beds. Fairmont The Palm accepts these cards and reserves the right to temporarily hold an amount prior to arrival. Please note that room rates which include breakfast and/or Dinner is for 2 adults only. Additional fees will apply for extra adults and children upon check-in. Children age 5 and below eat for free. Please note that beach enhancements are taking place on the trunk of Palm Island adjacent to the Fairmont North and South Residence. Guests may experience visual as well as intermittent noise disturbance, however the hotel continues to operate as normal with access to the beach, four temperature controlled swimming pools and landscaped gardens. Guests are required to show a photo identification and the same credit card used to make the reservation upon check-in at the hotel. Please note that all Special Requests are subject to availability and additional charges may apply. Please inform Fairmont The Palm in advance of your expected arrival time. You can use the Special Requests box when booking, or contact the property directly with the contact details provided in your confirmation. 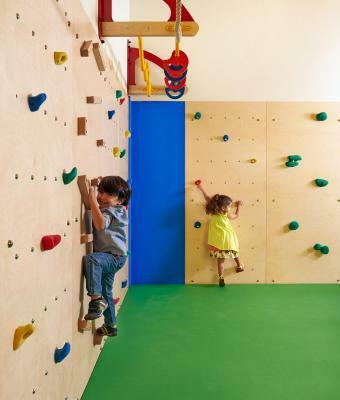 Guests checking in with children must inform the hotel in advance.